Judge Shriver started Ohio’s first OVI Court. He serves as Chair of the Ohio Supreme Court Commission on Specialized Dockets and as an ex-officio member of the Commission on the Rules of Practice and Procedure. He’s also a past president of the Association of Municipal/County Judges of Ohio and was elected from over 800 judges at all Ohio Court levels to serve as Vice President of the Ohio Judicial Conference. “For the past 18 years, I have been honored to serve as Judge of the Clermont County Municipal Court and feel humbled to have donated my time for local causes,” said Judge Shriver. “It is my heartfelt desire to positively impact the youth of our community before they become adult offenders.” Judge Shriver has seen the devastation of young lives created by the use of drugs in those who have appeared before him in court. Their choices have resulted in crimes and sometimes even death. Shriver collaborated with the Clermont Recovery Center to develop treatment and recovery programs that could help these young people. “My interest in helping youth stems from recognizing the fact that what they do now will influence the rest of their lives and I strive daily to make a positive impact before they become adult offenders. Both the day treatment program and the suboxone program developed with the Clermont Recovery Center have been successful in combating the youth drug abuse problem in our community,” stated Judge Shriver. Judge Shriver describes himself as a conservative and strict constructionist. 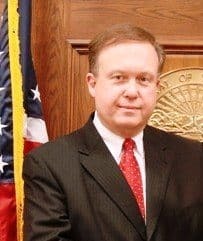 Shriver has presided over 100,000 civil and criminal cases during his judicial career and has endeavored to develop programs that reduce recidivism and promote safer communities, programs which have been recognized throughout the state of Ohio. The OVI Court Specialized Docket that he established in 2005 remains the premier model in Ohio and Judge Shriver readily shares the best practices he has developed with other interested courts. During his 18 years of service, Judge Shriver also assisted the Clermont County Mental Health and Recovery Board in securing private health foundation grants which benefited the Court by including the first-of-its-kind OVI Court Enhanced Treatment Program that focused on early intervention in order to provide in-depth assessments and essential family treatment groups. Among his many achievements, Judge Shriver was also selected to provide Legislative testimony concerning ramifications of Amended Senate Bill 17 regarding OVI law, the establishment of a penalty for not having a motorcycle endorsement in House Bill 17 and changes proposed in House Bill 1 regarding Indigent Drivers Alcohol Treatment. Most recently, Judge Shriver testified before the Legislator regarding changes impacting the driving under suspension laws. Clermont County Municipal Court received numerous awards during Judge Shriver’s tenure, including two Clifford Skeen Awards for Excellence in Community Corrections, the Safety & Justice Award from Clermont 2020 for the OVI Court team, the Award of Excellence from Mothers Against Drunk Driving for exceptional dedication and service, and the National Association of Counties Award in recognition of a jail diversion program for mentally ill offenders. Shriver’s personal awards include the President’s Award for Judicial Excellence from the Association of Municipal/County Court Judges of Ohio, the C.J. McLin Award from the Ohio Justice Alliance for Community Corrections, and the Wasserman Champion Award for his initiatives which benefited consumers of mental health and alcohol/drug addiction services. Before Shriver was a Municipal Court Judge, he served as a volunteer for the Clermont County Task Force on Child Sexual Abuse and chaired the Clermont County Youth Services Advisory Board, the Clermont County Child Abuse & Neglect Advisory Board, and the Clermont County Foster Parent Advisory Committee. He still remains actively involved with the Clermont County Special Olympics. His previous work in Probate Court included cases involving the mentally ill, the developmentally disabled and the abused, neglected and exploited adults. He’s a member of the Mt. Moriah United Methodist Church, where he serves on the Administrative Council and Building Study Committee. Judge Shriver will replace former Judge Stephanie Wyler, who retired in December. Judge Shriver will run in the November 2014 general election in order to serve a full six-year term on the Probate/Juvenile Court, which begins February 9, 2015.